Ralph and Vanellope get into a new game called Slaughter Race in Ralph Breaks the Internet. The world of Wreck-It Ralph was born from video games. In the first film, there’s Fix-It Felix Jr., Sugar Rush, and Hero’s Duty. And even though the second film, Ralph Breaks the Internet, doesn’t take place in an arcade, the filmmakers were not going to miss a chance to add another game to the universe. That new game is called Slaughter Race and it’s a huge, huge part of Ralph Breaks the Internet. You might not know that yet because it’s been only glimpsed briefly in the promotional materials, but it’s the game that stars Gal Gadot’s character, Shank. However, once you see the movie, you’ll not only want to play Slaughter Race immediately but learn more about it too. Unfortunately, we can’t help with the former, but we can help with the latter. “We knew Vanellope should end up in a racing game, that it was going to serve as sort of a wedge in [she and Ralph’s] relationship and that it would be something where she would start to fall in love with the internet,” co-director Phil Johnston told io9. From there, inspiration was initially drawn from that past. In the first Wreck-It Ralph, early on in development, there was going to be a fourth game. A kind of Sims meets Grand Theft Auto hybrid called Extreme Easy Living 2. And though Slaughter Race is way, way more intense than that, co-director Rich Moore admitted they drew some inspiration from that previous work. The stars of Slaughter Race, Shank and her crew. Extreme Easy Living 2 was cut from Wreck-It Ralph for a bunch of reasons, but one of the biggest was the idea that a lazy spring break game didn’t make sense for the setting. While there’s no competitive hot tubbing in Slaughter Race (at least that we see), Ralph Breaks the Internet takes place in the internet, which meant the world of online gaming was a component that had to be explored. The game also had to serve a thematic purpose, though, and Moore recalls that also took some trial and error. Within the world where Shank and her crew blow things up and race cars, Vanellope gets her very own huge musical production number, much like a classic Disney princess song. That song developed late in the filmmaking process and came about for two reasons, one of which was simply the filmmakers thinking, “Oh my God! Wouldn’t it be cool to do a big musical princess song in the middle of Saints Row or Grand Theft Auto?” Moore said. And so they did. Shank, voiced by Gal Gadot, is the star of Slaughter Race. The other reason, oddly enough, came from the highly-publicized Disney princess scene. The resulting song is called “A Place Called Slaughter Race,” and is performed in the movie by Silverman and Gadot with music from Disney legend Alan Menken. A pop version by Julia Michaels also runs over the credits. 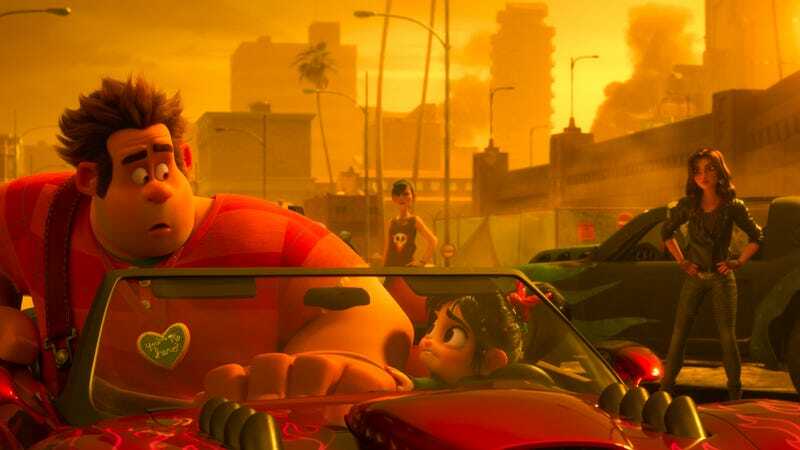 The scene is one of the film’s big highlights, a true showcase for everything that makes the latest game in the world of Wreck-It Ralph just right.